Jenny’s “Punch & Judy”-style booth is also the setting for her other puppets to perform their shows. There are a number of different shows for different age groups up to seven years old. For the younger ones, the shows are full of talking animals, the five-year-olds are visited by a fairy or a wizard, while the six-year-olds love stories with a pirate or a fairy – and sometimes both! Whichever show they see, the children are always excited, shouting out in anger at the thief or laughing at the naughty rabbit. The scripts encourage the children to feel part of the action and more than once, a child has demanded to see the show again when it is finished! The puppet shows are not suitable for three-year-olds if there is a large group of adults talking in the background. However, in nurseries or schools, or at parties where the adults either join in or do not talk, the puppet show can really capture their imagination. 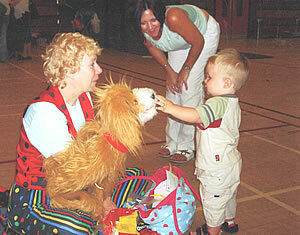 In addition, Jenny has a number of larger puppets which are held on her arm and can interact more directly with the children. They love to touch and are fascinated by the strange creatures.